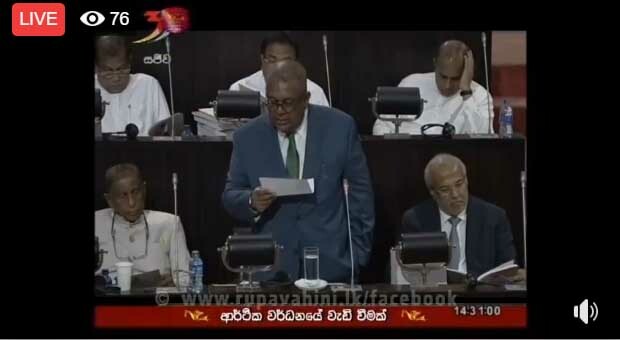 (Lanka e News - 05.March.2019, 10.30PM) The Government’s fifth Budget presented in Parliament by Finance Minister Mangala Samaraweera today. Here are some of the most important budget proposals in his speech. * ‘Gamperaliya’ will focus on the infrastructure needs and bridge the gaps of facilities that are needed. We have allocated Rs. 48,000 million and already began work. This is the first cabinet paper that we brought when the cabinet was reconvened. * Moragahakanda multipurpose project will be finalised by 2020. For the Yala Maha seasons Rs. 12,000 million has been allocated for the construction of waterways in Wayamba, Maha Ela Minipe construction. * Fish imports to Europe increased by 14%. We will construct two new harbours at Pesalai and Mandaitivu and have allocated Rs. 113,000 million. * Free glass of milk for primary school children across the country. * Even though we have developed with new roads and expressways but there are 1 million people with no sanitary facilities in the country. More than 100,000 in Hambantota district have no sanitary facilities. There are 25,000 houses with no washrooms in Monaragala. When this end we will promise that there will be no house without a washroom we will allocate Rs. 4 billion towards this. Every main bus stations and railway stations will have washrooms for men, women and the disabled. I invite the private sectors to maintain this. * Home Sweet Home loan scheme for newly married couples. The loans have a repayment period of 25 years and they have a 6% interest rate. * 1,000 art graduates will be trained through internships and Rs. 25,000 will be paid by the government, Rs. 300 million has been allocated for this. * Students who have excelled in studies will be given internships to top-notch universities, we will begin by offering 14 students on internships this year and we hope to send 28 students. The only requirement is that students return to home when their studies are complete and work for at least 10 years. * There are 300,000 A/L students, but only 30,000 enter local universities and some students don’t have sufficient funds for higher education. Therefore we will introduce the My Future loan scheme. We have allocated Rs. 200 million. Fourteen (14) students at A/L to receive full scholarships to Harvard, MIT, Oxford, Cambridge etc. Next year increase to 28. Will be bonded for 10 years upon return. * Prepaid card and GPS centered bus system will be established in the future. A central digital platform for bus services will be established. 250 buses will also be added to the SLTB. We will bring in buses that are accessible to differently abled persons and we have allocated Rs. 1,500 million for this. Light Railway transit system will begin construction this year and we have allocated Rs. 5,000 million for the project. * NBT will be established for the tobacco products, thereby the price of a cigarettes will increase by Rs. 5 as of June. Rs. 152 billion has been allocated for agriculture (Rs. 87 billion) and irrigation (Rs. 65 billion) – this includes expenditure on fisheries and livestocks sectors under agriculture. The key priorities in agriculture are improvements of access to markets and value chains, shifting towards higher value crops, reducing post harvest losses and improving storage, supporting investments in climate resistance, and enhancing access to finance to support technological investments. In agriculture the government recognizes the value of connecting small farmers into larger value chains to ensure a market for higher value agri products. Rs. 250 million has been allocated in the budget proposals to support small farmers to obtain the technology and know-how to shift to higher value crops whilst connecting these farmers with larger companies who will buy the end products for export or domestic markets. Poor storage and wastage results in significant loss of agricultural productivity and erodes farmer incomes. The government will invest in the hard infrastructure to set up climate controlled warehouses, which the private sector will be invited to manage and operate. Pure private investment in such operations is also encouraged by removing upfront costs of such investments. Overall, Rs. 1.7 billion has been allocated for agriculture sector modernization programmes which will result in improved technology, connectivity to markets, and agricultural infrastructure. Given the increased risks associated with climate change and natural disasters, the government is allocating Rs. 1.5 billion for farmer insurance. Enterprise Sri Lanka loan schemes are extended to the agriculture, livestock, and fisheries sector including the Ran Aswenna loan and the Govi Navodya loan schemes. Rs. 1.3 billion is allocated for development and rehabilitation of fisheries harbours. Two new harbours will be established at Point Pedro and Pesalai and a new anchorage will be established in Mandathivu. The government will bear 50% of the investment cost of installing better fish storage facilities on board multi-day vessels through RSW and CSW chilling systems, and also for equipment used for vessel monitoring, and safety systems. Rs. 300 million is allocated. Investments in irrigation include the moragahakanda-Kalu ganga project (Rs. 12 billion), Uma Oya diversion project (Rs. 7.3 billion), Yan Oya Project (Rs. 4.5 billion). Rs. 344 billion has been allocated in the appropriation bill for education and higher education. The 13 years of education programme is a key ongoing project of the government which will expand education opportunities across a range of skill sets. The government is cognizant of the need to invest heavily in education quality to ensure desired outcomes. Envisaged education reforms will help nurture the analytical and creative skills required to thrive in the modern economy. Rs. 6 billion has been allocated for ongoing education reform programme including substantive curricula reforms. There are ongoing plans for introduction of STEM+A to enable students to combine subjects across streams eg. mathematics with music. A further Rs. 3.6 billion has been allocated to support technological education. Rs. 16 billion has been allocated to upgrade overall school facilities including laboratories, libraries, classrooms, and sanitation facilities – a key element particularly to ensure undisrupted education for girls. Teacher training is also a crucial element of ensuring education outcomes and Rs. 100 million is allocated for continuous professional development for teachers. Additionally, Rs. 500 million is allocated for Tamil Medium teacher training. The government will launch the Scholarship for Educational Excellence (SEE) to enable the best performers from Sri Lankan schools to apply to the world’s best universities. The Fund will support the university education of the top performers in each stream and the top performer from each province. The government is also supporting the neglected area of pre-school education – a key stage of development of a child. A regulatory framework, including curricula and teacher training, is being designed to enable private participation in the sector as well, supported by a concessionary loan scheme for qualified applicants. Rs. 1.1 billion has been allocated for investment in early childhood development. A network of high quality pre-schools will also support greater participation of women in the work force. Rs. 25 billion has been allocated for investments in facilities at universities including professorial units, libraries, theatre complexes and other measures for higher education expansion and development of quality. Whilst investing heavily in state education, it is necessary to enable an appropriate role for non-state education as well. Towards this end, a loan scheme has been initiated under Enterprise Sri Lanka to extend to students applying to qualifying non-state higher education institutes, Rs. 1 million at a subsidized rate of 6% with a 2 year grace period to be repaid over 15 years. Significant investment is being directed to upgrade skills to align human resource capabilities with work force demands. Towards this end, the government is supporting approaches such as apprenticeship programmes and internship programmes that are initiated by the private sector. For instance, in sectors such as health and IT, skill development programmes led by the private sector will be supported by the government in the form of stipends during the training period. In the IT sector for instance, graduates in non-technical subjects will be absorbed into the industry for a training period during which time the government will provide a stipend of up to Rs. 25,000/- per month per student. Rs. 300 million has been allocated for this. Through this approach, the training will be provided for exactly the type of skills required by the industry. A similar approach is being initiated in the nursing sector and pharmaceutical industries. The government is also supporting skill development in the construction sector led by CIDA for which Rs. 300 million has been allocated. This will help develop skills in these key areas. Depending on the success of these programmes, the government will encourage other industry bodies to develop similar projects. In addition, the Sri Lanka army has a substantial capacity to support the government in its initiatives in skill development for various technical skills to support independent livelihoods. The SLA will provide NVQ certified training programmes in skill areas such as electronics, welding, carpenting, plumbing, agriculture, and animal husbandry. Trainees will be provided with a stipend during the programme. The bedrock of the government’s support for enterprise, SMEs and local entrepreneurs is the Enterprise Sri Lanka loan scheme, which covers a whole gamut of sectors from agriculture, to manufacturing, and the service sector. Already over Rs. 60 billion of loans have been disbursed in through the different loan schemes. A guarantee fund for SMEs will support the implementation of innovative business ideas whose owners lack the relevant capital or collateral. The Enterprise Sri Lanka loan schemes will also connect borrowers with institutions such as ITI, ICTA, EDB, and the Universities to link such entities with a larger ecosystem for startups and small business. In order to create better opportunities for startups and SMEs, government procurement will be amended to ensure that at least 10% of the value of such government procurement is ear marked for Sri Lankan SMEs. The Enterprise Innovation Programme is being launched. This will support the development of new innovative projects and technology by Sri Lankan firms. The programme will provide matching grants for proof of concept, prototyping, R&D, and technology adoption. Rs. 40 million is allocated through the appropriations bill and a further Rs. 50 million is proposed in the budget. Limited Liability Partnership structures were proposed in the previous budget and the legislation for this has been drafted and will be introduced into law in 2019. This will support investment in startups and venture financing. Ongoing investments into Sri Lanka’s technical research capacity are continued with this budget. Rs. 1.2 billion has been allocated for the nanotechnology sector, along with continued investments in the Vidatha programme (Rs. 114 million) to connect scientists to industry to enable transfer of technology, and the scientific development programme (Rs. 110 million). Along with the funding for the National Quality Infrastructure programme under the National Export Strategy, which will upgrade and integrate Sri Lanka’s quality infrastructure, investments are also continuing for physical infrastructure in the research sector including laboratory facilities for SLSI (Rs. 100 million) and the establishment of a science centre (Rs. 100 million). The key priorities in the export sector are to ensure improved access to markets, enhanced capacity for product development and quality to ensure acceptability in such markets, encouraging greater technological embodiment in our exports to ensure competitiveness, and to reduce non-tariff barriers to trade through trade facilitation. The 2019 budget continues to support programmes initiated in the 2018 budget – this includes the Export Market Access scheme and the National Export Strategy. The Export Market Access programme has an allocation of Rs. 400 million in the appropriation bill. This programme will support companies seeking to establish export presence or expand exports. The National Export Strategy (NES) has an allocation of Rs. 250 million as per the budget proposal. These resources will support sectors including electronics, spices & concentrates, boat building, ICT, wellness tourism, processed foods, and logistics. The NES includes the implementation of the National Quality Infrastructure which will support better resource utilization amongst laboratory and testing facilities which can serve both the export and import sectors. The budget also supports the seafood exports sector through investments in higher end fishing vessels that are compliant with EU requirements to access GSP +. This includes vessels with chilling facilities, safety and monitoring features. The government will bear 50% of the cost of these investments. The solid tyre sector has become a major export for Sri Lanka – the government will facilitate the private sector to invest in testing and prototyping facilities for product innovation to enable the industry to remain at the helm of global markets. Support is also given to improve latex production by doubling incentives for rubber planting. Sri Lanka is also the world’s major producer of Ceylon Cinnamon, and the budget will support the ongoing initiative to secure Geographic Indicator for this product. The IT initiative will be expanded to train 1,000 non-technical graduates through internship programmes where the government will bear 50% of the salary. The minimum employment requirement of 50 employees to benefit from the 35% additional deduction for the IT sector will be removed. The government is committed to the strategy of building a network of trade agreements to link into regional value chains. After reviewing the Singapore FTA the government will build on progress made in negotiations with India, China, and Thailand. The budget will support the Break into India and China Market Entry Strategy. Firms establishing in these and other key markets will be supported by proposed Trading Houses for priority sectors which will help Sri Lankan firms secure distribution networks, buyer linkages and other requisite support in market penetration. The government will continue its programme of paratariff removal to improve competitiveness of the economy and enable better resource allocation to tradable sectors. Macroeconomic policy has been supportive of the tradable sector by ensuring a competitive exchange rate. A trade adjustment programme with an allocation of Rs. 250 million in 2019 is also proposed to help firms and workers adversely affected by tariff liberalization. The Economic Service Charge of 0.5% has been reduced to 0.25% for export companies (including IT and tourism). This will support cash flows of these companies. Amendments are proposed to the Customs Ordinance which will improve trade facilitation – enhancing transparency, risk management, consultation, and appeals processes. The Authorized Economic Operators programme will be launched by Customs in 2019 enabling better risk management by focusing resources on the highest risk cargo whilst facilitating compliant traders. Implementation of the National Single Window will be accelerated with a proposed allocation of Rs. 30 million. A package for high value investments is proposed. This entails removal of upfront investment costs for investments over US$ 50 million, and additional capital allowances ranging from 100% to 150%. For investments over US$ 1,000 million additional benefits including exemptions from dividend tax and PAYE are also proposed. Industrial zones in Bingiriya and Wegawatte will be supported with Rs. 500 million proposed. The appropriation bill and budget proposals for 2019 includes allocations of Rs. 232.7 billion for the health sector. This includes Rs. 182 billion recurrent expenditure and Rs. 50.7 billion capital expenditure. The appropriation bill includes allocation for medical supplies of Rs. 45 billion, and bio-medical equipment of Rs. 5.6 billion. The allocation for the Thriposha programme is Rs. 3 billion. Rs. 24.8 billion is allocated in the appropriations bill for investments in improving the quality of infrastructure in government health facilities. In addition to infrastructure there is significant investment into patient care. Rs. 1.6 billion is allocated for primary health care units to develop coordination of patient care over time, referral networks, and treatment follow up measures. The Suwaseriya Ambulance programme has been extremely successful at addressing emergency treatment and critical interventions, saving lives across the country. Rs. 2 billion has been allocated through the appropriations bill to support the programme, and a further Rs. 600 million is proposed over 2 years through the budget to establish 300 base stations across the country, to further improve service delivery. With the increase of non-communicable diseases the necessity for palliative care for those who are terminally ill has arisen – Rs. 50 million is allocated to establish capacity building for such treatment. Significant support is provided in the budget for investment in elderly care facilities. Investments to detect and treat CKDU continue and Rs. 550 million is allocated through the budget. Rs. 100 million is allocated for the control of rabies through a sterilization programme, which will also help solve concerns about the stray dog population. It is also necessary to address skill requirements in the private sector. Towards this end the budget will share costs for training of nurses and pharmaceutical professionals by developing an “apprenticeship model”. During the apprenticeship the government will provide a stipend (nurses Rs. 10,000 and pharmaceutical professionals Rs. 15,000) to support the salary of the trainee. In addition, the appropriation bill allocates Rs. 1.3 billion for a nursing faculty. The appropriation and budget proposals encompass allocations of Rs. 39.5 billion for the housing sector, of which Rs. 38 billion is capital expenditure. A major objective of this government is to make Sri Lanka into a home-owning democracy. Already substantial investment has gone into this sector across different value segments over the last 3 and a half years. At low income income levels the government bears the major part of the funding, at the mid-range level the government will share the costs of funding through subsidized loan schemes, and at the higher end the government will provide a conducive environment for private investments in housing. Significant investment is allocated for low income housing with Rs. 7.5 billion allocated and a further Rs. 2.9 billion for estate housing. In 2019 several middle income housing projects will commence, including projects in Wadduwa, Ragama, Yakkala, Kundasale, Borella, and Pannipitiya, among others. Rs. 8.1 billion is allocated through the appropriations bill for the Urban Regeneration project. The appropriation bill and budget proposals also suppors housing for re-settlement projects with a total allocation of Rs. 13.5 billion for this. In addition to public housing, the government is supporting investment in private housing investments. The Home Sweet Home loan under the Enterprise Sri Lanka loan scheme will provide Rs. 10 million loans at concessionary financing of 6% for first time home buyers. This is another measure that will support middle income housing in Sri Lanka and help build a home owning democracy. Enterprise Sri Lanka will also provide Rs. 10 mn concessionary financing for migrant workers to invest in a home in Sri Lanka. The government will bear 75% of the interest cost and provide a 2 year grace period out of a 15 year loan tenor. To support local construction companies, in order to tender for future government projects, a foreign construction company must form a partnership with a local construction company. This will address the issues faced by local companies in facing up to international competition. In order to reduce the costs of construction, the para-tariffs applied to selected construction materials will be reduced. The NBT for the main contractor in construction projects will also be made exempt. To support the property development sector, a residential visa will be provided for 3 years for foreign nationals who invest US$ 300,000 or more in condominiums. Rs. 13.5 billion is allocated for public investment in railways lines across the country including the Colombo suburban railway improvement project and the Matara Kataragama railway line to connect the Southern Province. The appropriations bill and budget proposals allocate Rs. 194 billion for investment in roads and expressways. The development of a high quality network of roads is a crucial enabler for economic activity and public convenience. The government has invested over Rs. 700 billion in roads since coming into office in 2015. This includes Rs. 32.7 billion for the extension of the Southern Expressway and Rs. 15.4 billion for stage III of the outer circular highway. Work on section I and III of the Central Expressway will continue while continuing work on Section II. Work on the Ruwanpura Expressway, connecting Ratnapura District to the Southern Expressway will commence in 2019. Rs. 15.4 billion is allocated for the integrated road investment programme and Rs. 7.6 billion is allocated for provincial road development initiatives. The Gampereliya and Ran Mawath programmes (Rs. 10 billion) will see significant investments in rural roads as well.